You heard it right. Our Cyber Monday deal goes all week. 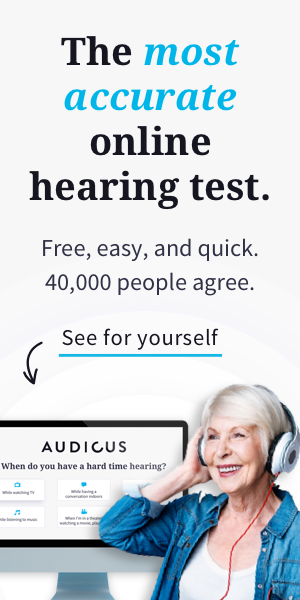 Audicus makes getting high-quality hearing aids easy and affordable. Now it’s more affordable than ever. While you’re browsing the best Cyber Monday deals this week, stay on your couch, keep the PJ’s on, and get the hearing solution that transforms lives. Take our Online Hearing Test from home and we’ll send you your custom hearing aids directly to your doorstep. Our friendly team of hearing experts is just a call away for step-by-step guidance. Just call (855) 432-7808. We already save you thousands on top hearing aids by selling directly to you and cutting middleman markups. Our award-winning Audicus Clara receiver-in-canal hearing aid features settings that adapt to your life, speech focus that cuts background noise, and seamless sound processing. Best of all, the Clara starts at just $699 per ear and we offer payment plans as low as $39 per month. Buy now and get an extra $150 off your pair. Just use CYBERMONDAY2018 at checkout.